Why are Star Wars: A Galactic Spectacular fireworks off-center? 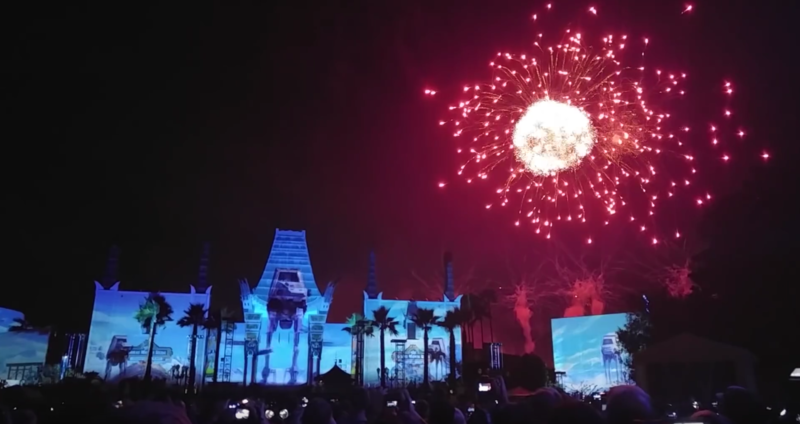 If you’ve seen the brand new fireworks show at Hollywood Studios, Star Wars: A Galactic Spectacular, you noticed one big departure from other fireworks shows at the park. There is a new fireworks launch site that is across World Drive and its location leads to off-center fireworks in relation to Hollywood Blvd and the Chinese Theater. Let’s take a look at why that is. First off, where exactly is the launch site? We first took a look at the new launch site back in February where aerial imaging, combined with permits, gave us this first look at how off-center the fireworks really would be. Note that a straight line down Hollywood Blvd is drawn in red. So why there? Why so off-center, leading to really terrible views of the fireworks if you’re standing along Hollywood Blvd? For reference, here’s what the new show looks like from just past the entrance hub (near the start of the red line on the right). The answer is that Disney had no other choice. The old fireworks launch point sits right in the middle of what will soon become Toy Story Land. 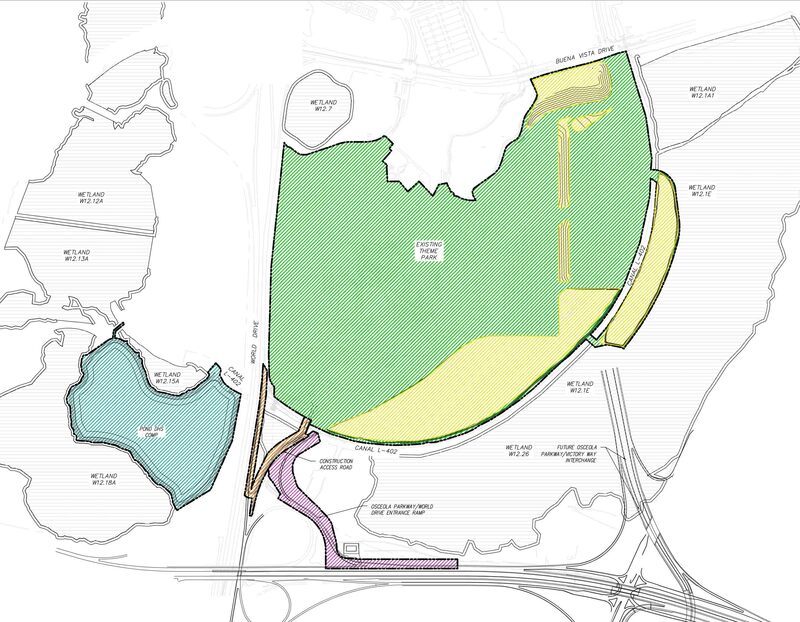 As construction and clearing is already taking place, Disney had to find a new location. They chose the above location across World Drive. Ok, so new construction forced their hand, no problem, but why didn’t they just center them across World Drive? Once again, their hands seemed to have been forced. As part of the wetlands permits that we first laid eyes on in late October 2015, they have to build a new retention pond to relocate the water that they’ll offset due to raising of already low-lying areas (depicted in yellow below). Here’s a look at that pond on the left side of this page of the permit. Comparing the above permit with the pictures of the new launch site further up in the post, we can see that they couldn’t have built the launch site any further south than they already did due to this yet-to-be-built lake. Now, we don’t know enough about the location or sightlines from Star Wars Land or Toy Story Land to know if there might be some great views, but for the time being it looks like you’re going to have to devote an hour or two of standing in the hub at Hollywood Studios to ensure that you have the best view of the brand new show. Next articleVIDEO + PHOTOS : Frozen Ever After full ride through! It is off center now, but I bet when Star Wars Land opens that there will be a new and improved viewing area for the fireworks which will then be lined up. If you look at the concept art for the firework, you can see that the fireworks are off centre. So they did plan to do it that way, and they have shown that its off the centre.